We have successfully reverse engineered the STEC 24850-00211-XC1U controller used in many OEM solid state drives. These controllers are commonly found in mini-PCIe solid state drives sold by Dell for use in Dell Mini Laptops (DP/N: 0X422G & 0D154H) When these drives fail they are typically recognized by the BIOS but are inaccessible to the OS. We have developed proprietary techniques for recovering data from these drives. 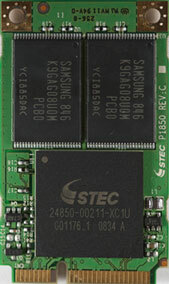 To date we’ve seen the STEC 24850-00211-XC1U controller using either four Samsung K9LBG08U0M (2GByte) or four K9GAG08U0M (4GByte) NAND chips with a page size of 4224 and 128 pages per block. Interestingly the controller stores metadata in the last 10 pages making the effective block size 118 pages per block. After accounting for two plane operations on all NAND chips there are four remaining banks, each of the four banks is striped at different block addresses within each bank. Each block must be sequentially ordered in each bank and then interleaved with the neighboring bank. The interleave varies by model and there can be multiple interleaves for example a four way stripe against each sector followed by a two way page stripe.